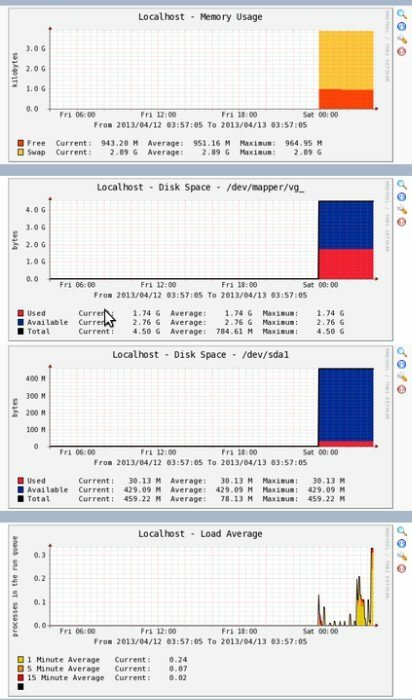 Cacti is one of best monitoring tool used to monitor network, CPU load, memory, Disk and other services. Cacti uses PHP for front end, RRDTool for graphing and mysql for storage. Cacti installation on centos requires LAMP setup and SNMP. Install cacti on centos 6. Before installing cacti, first we need to setup apache with php, mysql and SNMP services. you can also refer this post (Installing Apache2 , Mysql server and PHP on Centos 6 (LAMP)) for complete LAMP setup. Step 1 » Issue the below command to install apache, php and mysql. Step 3 » Issue the below command to create mysql root password. issue this command to secure your mysql database. Step 4 » Create new database “cactidb” and username/password to access “cactidb” database . Here “usercacti” is the username and “passwordcacti” is the password to access “cactidb” database. 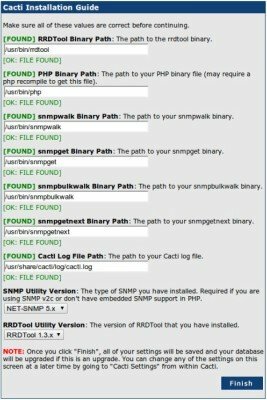 Step 5 » Now install SNMP by typing the below command. Step 6 » Rename the original snmpd.conf file and create a new one . Step 7 » Add the below lines to /etc/snmp/snmpd.conf ( New file ). You should able to get your ip details . Step 10 »Install the latest EPEL rpm . Step 12 » Now import cacti database tables from the file cacti.sql . Issue the below command to find the location of cacti.sql file. Step 13 » Now open /etc/cacti/db.php file and edit the below lines . Step 14 » Open /etc/httpd/conf.d/cacti.conf file and comment all “Deny from all” lines. Step 15 » open /etc/cron.d/cacti file and uncomment the line . Step 17» Now open http://serverip/cacti in your browser , you can see the cacti installation page. if you are not getting installation page , Disable the firewall ( iptables ) and selinux service on your server . After getting installation page, proceed with the default values and make sure all the binary paths are found as per the below image. upon completion, you can see the login prompt . Step 18» The default username and password for cacti is admin/admin. you will be forced to change the password at first login. Step 19» After login . Choose – > Devices – > Localhost and find “SNMP Options“. select SNMP Version -> “Version 2” and SNMP Community -> public and click the “save” button at the bottom. Step 20» Now you can see the SNMP information at the TOP . Click “Create Graphs for this Host” and choose Graph Types:-> ALL and choose all the check boxes as below and press “create“. Now choose the colour option ( Leave as it is ) and press “create“. After few minutes , you can see the initial stage of graphs for localhost in the Graphs section . after few hours you can see the graphs like below . » Follow steps 5,6,7,8 and 9 ( In client ). » Now in cacti , “Create devices” and Add description and hostname (or) IP . » Choose “Host Template” as “Local linux machine”. » Under SNMP Options select SNMP Version -> “Version 2” and SNMP Community -> public and click the “save” button at the bottom. » Add the device to the Graph tree. » Make sure you added community name “public” and allowed your Cacti server IP. » Choose “Host Template” as “Windows 2000/XP host”. Can you please explain lines written in your /etc/snmp/snmpd.conf ? sorry but say “Disable firewall”,”Disable Selinux” is not trusted. thanks, this was a good article it helped me out.